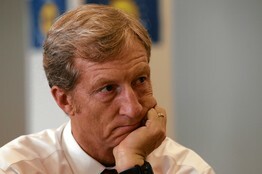 Billionaire Tom Steyer's vow to make politicians toe the green line isn't working out so well. As political comedowns go, there may be few to compare to the humbling of Tom Steyer. Six months after the climate activist roared on the national political scene vowing $100 million to impose his agenda on this fall's midterms, it would appear that this billionaire don't hunt. Remember the liberal huzzahs that greeted the February pledge? The New York Times gave Mr. Steyer the front page, heralding a coming "hard-edge campaign of attack ads" that would pressure officials to "enact climate change measures" and persuade voters to back a climate agenda. Democrats hailed him as their new power broker, crowing about a war chest that could rival the Koch brothers and even up the midterm election odds. Environmentalists welcomed a white knight who would finally align the party and public behind their priorities. Or not. Mr. Steyer at an Aspen conference this week revealed that little if any of this is happening. The left is as split over energy as it has ever been; the public isn't buying the climate line; and the hedge-fund-manager-turned-activist looks to be regrouping. The Steyer grand plan began unraveling from the start, when stories about his pledge noted that he might target Louisiana Democrat Mary Landrieu for her support of the Keystone XL pipeline. Mr. Steyer and his NextGen Climate Action PAC had in 2013 won activist praise for defeating a pro-pipeline Democrat in a Massachusetts primary, and the Louisiana idea was to start his midterm strategy with a similar litmus-test bang. A Landrieu attack would send a message: Democrats who bucked the climate agenda would get beaten, whereas those who embraced it would be rewarded with Mr. Steyer's campaign cash. Democratic leaders instead flipped out, and quickly schooled Mr. Steyer in the political realities of red states and the magic Senate number of "51." Within days of the pledge, Steyer operative Chris Lehane was tamping down the Landrieu story, insisting Mr. Steyer did not plan to "tea party" Democrats. "We do think it's really, really, really important from a climate perspective that we maintain control of the Senate for Democrats," he explained. Overlooked was that this single decision wiped Mr. Steyer's operation off most of the electoral map. If the billionaire could not attack pro-Keystone Democrats, he couldn't get them on board his agenda. And if they remained in support of Keystone, there was no way the leader of the anti-pipeline movement could—with any credibility—underwrite them. It's great to have $100 million to blow on midterms; not so great when you can't spend it in Louisiana, North Carolina, Arkansas, Alaska, Montana, Virginia, Kentucky or Georgia—for starters. Mr. Steyer was left the scraps of a few Senate candidates who do oppose Keystone: Colorado's Mark Udall ; Iowa's Bruce Braley ; New Hampshire's Jeanne Shaheen. Only to then discover that few would benefit from his help—at least not in a state like Iowa, where support for the jobs-creating Keystone project is thunderous, and where Mr. Braley's opposition is a political liability. NextGen, which bragged in May that it would make climate a "wedge" issue in "political races," couldn't even bring itself to mention the environment in its first ad of the political season, against Iowa Republican Senate candidate Joni Ernst. It instead hit her for supporting lower taxes. It might also help if Mr. Steyer had the $100 million. His February vow was to match $50 million of his money to $50 million from donors, and he bragged that might be a "lowball" number. By last month, Politico was reporting that NextGen had raised all of $1.2 million. Seems Democratic donors have higher funding priorities than climate. Thus Mr. Steyer's apparent sayonara this week in Colorado to that "hard-edge campaign of attack ads" and the "wedge." He explained that he now thinks the real problem for "pro-environment candidates like Mark Udall" is that their supporters are the "likeliest drop-off voters." So he will focus "not so much on TV ads" as the "18th-century politics" of getting "local people to talk to local voters" and get out the vote. And what about selling the public on a climate agenda? "This is much more about showing up than persuasion," he said. This is a shadow of Mr. Steyer's soaring February promise. And even the new-and-reduced strategy may be of little use in Colorado. He played a big role last year ginning up green grass-roots anger over Keystone. This fury, ironically, boiled over into Colorado's natural-gas debate, where activists have revolted against Mr. Udall for his tentative support of fracking. Mr. Steyer might say Mr. Udall is "pro-environment," but his word is no longer good enough for the fractivists. Getting out that vote might prove hard. In a high-stakes midterm every race matters and every dollar counts. And so Mr. Steyer's millions—a fair amount of which is going to Democratic political groups that are more effective than his own—still matter. But his NextGen meltdown is a lesson for liberal Democrats and activists looking to impose an anti-energy agenda on the country. The public isn't buying it.